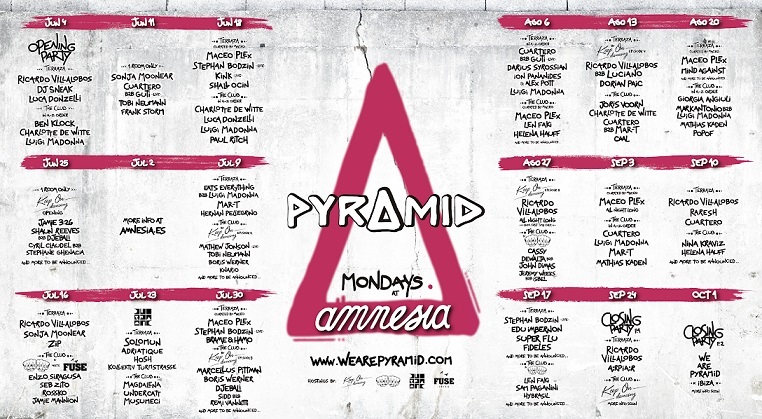 Nina Kraviz, Ben Klock, Charlotte de witte and more have been confirmed for the debut Pyramid season at Amnesia Ibiza. Kicking off on Monday 4th June and running through until 1st October, the weekly throwdown will also see Ricardo Villalobos play six times— including one all-night-long set and a special b2b with Luciano. Maceo Plex, a:rpia:r, Helena Hauff, Mar-T and Raresh are also confirmed. Live performances have not been overlooked, either, so think KiNK, Mathew Jonson, Gaiser and three shows from Stephan Bodzin. Further highlights will no doubt include Shaun Reeves with Djebali, Eats Everything b2b Luigi Madonna and Dewalta sharing the booth with John Dimas. In terms of concept, we've been promised a residency that values old school Ibiza vibes, meaning heavy on production, showmanship and decoration. Hamburg super-label Diynamic is also involved by way of a day party, with bossman Solomun— who has his own residency over at Pacha— joined by Adriatique, HOSH and Kollektiv Turmstrasse on the terrace. There's also the small matter of two huge closing parties, with the summer finale still to be revealed. Full details of the series opening party can be found here.